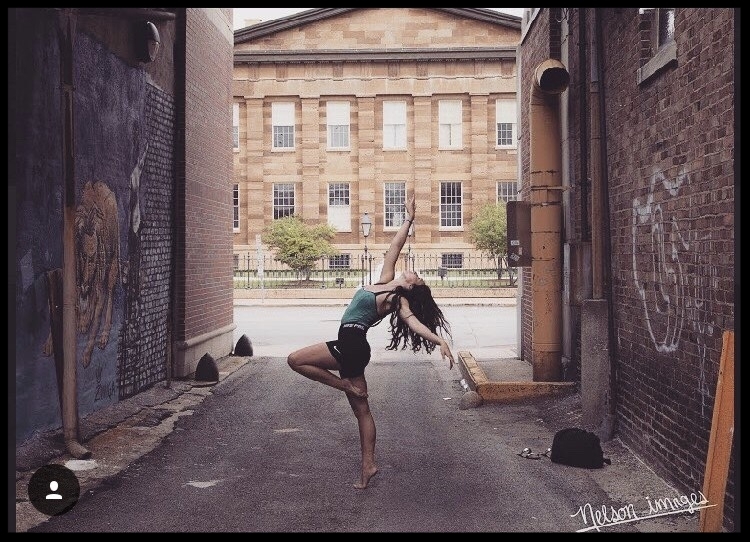 Jaelin Heavisides became a student of Springfield Dance when she was ten years old. She was an avid distance runner which made her hamstrings VERY tight, putting it mildly. She could not bend over to touch her toes or her knees, for that matter. She really wanted to learn to do the splits. I gave her LOTS of stretches and continued to encourage her, thinking the whole time that this poor child may NEVER learn to do the splits because of her tightness. She worked hard--very hard. It was about three years later that she sent me a picture of her in her front yard doing the splits. Saying that I was proud was an understatement. Jaelin has continued to work that hard through her entire dance career, and I expect her to go to great heights. JH: I am pursuing a career in dance and am still taking classes to prepare me for auditions. I also work in administration to the learn the other side of the dance world, as well, so that I can keep dance in my life post performing! JH: Dance taught me many life lessons at a young age, from discipline to time management to working with others. I value and use all of those skills everyday. A life lesson dance taught me, which many people might not learn, is how to deal with rejection. Not getting the part you wanted, or not getting a part at all, can be heartbreaking, even it’s for a reason beyond your control, such as height or hair color. However, being rejected only taught me how bad I wanted to dance and encouraged me to work harder. This applies to adult life through auditions for dance jobs or even interviews for unrelate dance jobs. Dance has taught me to never give up and always work hard! JH: Along with taking class, I try to keep myself in a routine of stretching and working out. As far as conditioning is concerned, I incorporate cardio and pilates based exercises into my routine. I have my foam roller and thera bands in my room, so at the end of my busy active day, I remember to be kind to my muscles! JH: SO many memories! The people!!! The bond I built with my fellow dancers and teachers is truly something special. A specific memory I have is when we all were obsessed with the tv show dance moms, we decided to plan a day and surprise Miss Ronda and show up in “dance moms” attire, aka breaking dress code, dancing in shorts and sports bras!! I remember it being a super fun day filled with lots of laughs, as we channeled our favorite dance mom divas. SD: If there was one thing you would change about your dance experience, what would that be? JH: Hmmm there isn’t really anything I would change about my experience other than, maybe, wish I would have started earlier! I started at the age of ten which to some people consider “late." I had a lot of catching up to do, but, thanks to my great teachers, they were encouraging and got me up to speed! JH: Dance truly has played a major part in shaping me into the adult I am today. As I mentioned earlier, it has taught me how to be disciplined and work with others. Dance brought me out of my shell. I was a VERY shy kid and being in dance class helped me break out of my comfort zone, encouraging me to put myself out there and installed a sense of confidence with always remembering to be humble and grateful for opportunities. JH: I would go back and tell my younger self to kick self doubts to the curb... confidence is key! JH: I truly believe dance is important for children as it teaches many life skills and gives kids an outlet. JH: I would love to see dancers share their growth by encouraging the younger kids, making them excited about being the next generation! We are always so thrilled when you come back and share your talents with our little dancers. Come home soon, Miss Jaelin!